I’m Hans Lassmann, retired Professor of Neuroimmunology of the Medical University of Vienna, and my current position is that of Research Associate at the Center for Brain Research in this university. The pathological hallmark of multiple sclerosis consists of chronic inflammation, which is associated with the formation of confluent plaques of demyelination in the brain in various different brain areas, including the forebrain, white matter, cerebellar white matter, the brain stem, the optic nerve and the spinal cord. The inflammatory demyelinating cascade is triggered by apparently activated T lymphocytes and B lymphocytes which may enter the central nervous system in the course of immune surveillance, but when they then find their cognate antigens, the true antigens, they get reactivated. They recruit additional inflammatory cells like, for instance, macrophages, they activate microglia, and then they induce the tissue damage in corporation with these macrophages and microglial cells. So that leads primarily to the demyelination but also to some axonal degeneration. Now, the inflammatory process also can lead to neurodegeneration, and neurodegeneration is characterized by the loss of neurons and axons in the tissue. Also, this can be achieved by inflammatory processes. And then, when there is neurodegeneration where the axons and the neurons are lost, this may then lead to permanent and unrepairable functional deficits in the patient, and this accumulates with time in the disease. So most of our evidence which we have suggests that neurodegeneration is indeed related to the inflammatory process, and this is very well shown, also, in various experimental models. However, we can so far not definitely exclude that there may be a neurodegenerative process in MS as a primary trigger which is then amplified by an inflammatory process which, actually, aggravates the disease. This is suggested by several people, but so far, the evidence for this second possibility is practically nonexisting. Now, in the relapsing stage of multiple sclerosis, the pathology is dominated by the appearance of new and focal lesions in the central nervous system, predominantly in the white matter, but to some extent also in the gray matter. This is apparently driven by an influx of inflammatory cells, in particular T lymphocytes and B lymphocytes, through the blood-brain barrier, and this process is associated with a leakage of blood-brain barrier. And then this leads then to the microglia activation and the destruction of the myelin sheaths and in part also the axons. In the progressive stage, there is also inflammation, but the inflammatory process is, to some extent, trapped within the central nervous system. That means blood-brain barrier damage is mostly absent in the progressive stage, but there are still inflammatory cells there which can actually be responsible for driving the microglia activation and the tissue damage. Brain volume loss is in principle the reflection of the neurodegeneration, that means of the neuronal and axonal degeneration, and it occurs already in the early stages of multiple sclerosis, but it accumulates and gets more and more with disease duration; and therefore, if you look at brain atrophy just on a global way, it’s certainly much more pronounced in the progressive stage of the disease in comparison to the early stage of multiple sclerosis. In principle, inflammation in all organs of the body arises around veins and venules. These are the sites where inflammatory cells leave the blood circulation, and therefore, the lesions in multiple sclerosis are also in principle distributed around veins and venules. And this also means that areas with high venous density in the brain are more likely to have lesions than other areas which have less numbers of veins in a given part of the tissue. The lesion distribution, therefore, is very characteristic. You find predominantly the periventricular lesions but also some lesions in the depths of the white matter in the cortical, subcortical junction, and then in particular, also, in the optic system and cerebella and brain stem and the spinal cord. Very important is then, also, the demyelination in the cerebral cortex, which is mainly related to an inflammation in the meninges, and therefore, it occurs in the cortex from the outside to the inside of the cortex, so the so-called subpial lesions, and these changes are particularly prominent in the progressive stage of the disease. In the early stages you find a massive influx not only of activated microglia but also an influx of activated macrophages through the impaired blood-brain barrier, and these cells together are responsible for the tissue injury. Now, in the progressive stage, the local microglia is activated either at the edges of plaques or in the entire—also entire normal-appearing white matter and gray matter, and that leads then to a much slower process of degeneration and tissue damage in comparison to the acute lesions in the early stages. Now, the new findings actually point very much to the direction that inflammation is a central driving force of the disease, and this inflammatory process actually can come from the circulation, but it can also be compartmentalized or trapped within the central nervous system. And in these areas then, it is predominantly located in the connective tissue spaces—that means the meninges and the large perivascular spaces. However, the inflammatory cells do not appear to directly damage the tissue, but there is now more and new evidence that there are soluble factors which are produced by inflammatory cells which diffuse into the tissue and then induce, actually, the demyelination and the neurodegeneration. It is currently a very important topic in research to identify these potential soluble demyelinating factors. It has already been shown in the very early stages in the 1960s that there is demyelinating activity in the serum and cerebrospinal fluid of multiple sclerosis patients, but the exact molecular nature of this demyelinating factor is currently not yet identified, and this is, certainly, an area of very intense research efforts. However, despite now what is the primary course of the demyelination and tissue damage, the downstream mechanisms have also become more clear during the last years. And here it turns out that a cascade of microglia activation leading to oxidative injury and then through the oxidative injury to mitochondrial damage is actually the major driving force, and this mitochondrial damage actually leads to a state of energy deficiency, or so-called virtual hypoxia, and that is certainly one major driving force of tissue degeneration and tissue damage in multiple sclerosis brains. Now, in principle, they play a role in all stages of MS, but they differ in quantity. So, for instance, the inflammatory process is most pronounced in the early stages of multiple sclerosis, and with disease duration this gradually declines. In addition, this inflammatory response becomes more and more trapped within the central nervous system, and with that, it’s very difficult then to reach this inflammatory process also with current therapies. The mechanisms of tissue damage are also similar in the early and late stages, but in the late stages, actually, they are superimposed with additional factors which are related to aging of the patients and comorbidities like, for instance, vascular problems, which also are associated with the aging process. It helps because it has been already seen in several—both pathological as well as MRI studies that areas of the brain which have from the beginning a lower oxygen tension and a lower vascular perfusion are more likely to have permanent and irreversible MS lesions in the brain, so not repairable MS lesions in the brain, and these are particular, for instance, these periventricular areas, which are very prominently affected in MS patients, whereas in other areas where there is good vascular perfusion, new lesions can appear, but these lesions can actually be in part repaired by remyelination and, therefore, again (inaudible)*10:24 even in the MRI investigations. 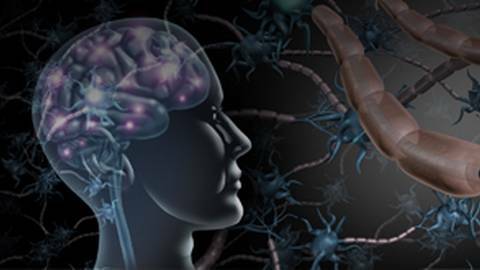 Now, all drugs which we have currently in use in multiple sclerosis target the immune system, and the aim is to reduce the inflammation in the central nervous system. You can achieve that by several ways. One is, for instance, a drug like natalizumab, which is an antibody against an adhesion molecule which is involved in the migration of inflammatory cells to the blood-brain barrier, and so when you use that, you block the entrance of inflammatory cells into the brain. The second possibility is that you target the peripheral T and B lymphocytes. And here, for instance, cladribine is one example which leads to partial depletion of these cells in the peripheral immune system, and so then there are much less cells available to be able to enter the central nervous system. And then there are other possibilities. For instance, you can reduce the activation of inflammatory cells—and here, teriflunomide could be one example—which leads to a bolus deactivation of the cells. The last possibility is that you hinder the cells to leave the lymph nodes, and here, fingolimod is one drug which can do that in this situation, and you again have reduced numbers of T cells in the circulation and as a consequence also reduce numbers of T and B cells in the brain. And then, finally, the new development is the action of ocrelizumab, and this is insofar interesting because multiple sclerosis for a long time has been regarded a poorly T cell-mediated disease, and now it turns out with the ocrelizumab trials that reduction of B lymphocytes actually has a very profound effect on the inflammatory affect in multiple sclerosis patients. The way how B cell depletion really leads to this reduced inflammation is not yet fully established. It could be in part the B cells themselves which are targeted. It could also be an indirect effect on T cells when B cells are eliminated. Now, I think it is very important that the patients should actually be treated as effectively as possible because blocking the inflammatory reaction in the early stage of the disease has a good likelihood also to halt the neurodegenerative process and then also to lead to a situation that patients get much later or even, if possible, not at all into the progressive stage of the disease. So this is a window of opportunity, and it has been shown, for instance, very nicely with alemtuzumab, because in that situation it turned out that alemtuzumab is a highly anti-inflammatory drug which actually blocks progression when used in the early stages of multiple sclerosis, and therefore, the atrophy by progression and disease progression is already very nicely halted. But when patients have already reached the progressive stage of the disease, this reduction of progression is no longer given, and that may also be due to the fact that an antibody like alemtuzumab has difficulties to get into the brain when the blood-brain barrier is already reestablished and, therefore, will have relatively little effect on the inflammatory response which is actually present and compartmentalized within the central nervous system. Now, it is quite clear that in MS there is a major inflammation with new waves of T cells, of inflammatory cells entering the brain associated with blood-brain barrier damage, and certainly, this inflammatory process leads also then to demyelination and neurodegeneration, but clearly here the inflammatory response is in the prime focus of the disease mechanisms. Now, in the later stages there is a stage where there is still this compartmentalized or trapped inflammation where inflammation still is important, but it is, in part, behind the repaired blood-brain barrier and, therefore, very difficult to target for treatment. But then, also, the tissue injury is propagated by additional factors, and these additional factors are mainly associated with aging and with age-related problems of the brain function and brain pathology. For this, one can actually list a couple of those. One is, in principle, the chronic microglia activation, which you have, in part, in aging, but also due to the brain damage in multiple sclerosis patients, which is already present and continues to be the case; then, also, age-related vascular comorbidities, which are certainly an additional problem, in particular when you have oxidative damage and virtual hypoxia; and then, also, it’s an age-related phenomenon in humans that the human brain accumulates iron, and when this iron is liberated in MS lesions, it can also, in addition, amplify the oxidative damage in the brain. So that means that in the progressive stage, there is still an inflammation, in particular in the early stages of progressive MS, but the neurodegenerative phenomenon are getting more and more prominent. And this has also, obviously, consequences for therapy, because in the early stages, the anti-inflammatory and immunomodulating therapy is the prime target. In the progressive stage, one would also need, in addition to that, neuroprotective treatment strategies which are actually acting in the brain and limiting tissue damage or even stimulating repair of the brain, which is unfortunately, so far, very limited. There are several trials ongoing—in particular, relatively small trials and exploratory trials—mainly supported by MS societies and other charities or public funding. The reason for that is that some of the drugs—or many of the drugs—are not really patent protected and, therefore, not in the major interest of the larger pharmaceutical industries. But there is also one trial which is possibly promising and which already reached the phase III stage. This is a trial with siponimod in progressive multiple sclerosis, secondary progressive multiple sclerosis, and this is an interesting trial because siponimod may have, in addition to these anti-inflammatory or immunomodulating actions, also a direct effect on the nervous system, being possibly also a neuroprotective drug. Explore the latest therapeutic developments and their potential role in transforming multiple sclerosis care paradigms. The basic pathologic hallmark of multiple sclerosis is inflammation, but the causal factors involved in the formation of confluent plaques of demyelination and neurodegeneration in the brain, as well as loss of brain volume, have been difficult to elucidate. Efforts to identify downstream sequences leading to demyelination have resulted in the development of newer pharmacologic agents, but the larger questions are if, in the clinic, these agents are 1) really effective; and 2) focusing on the right targets? Prof Dr. Lassmann receives royalties from Merck, Novartis, Roche, and Sanofi and receives consulting fees from Biogen, MedDay, and Roche. John Pirovitz has nothing to disclose. This activity is designed to meet the educational needs of neurologists, nurses, nurse practitioners, physician assistants, and other members of the interprofessional team who are involved in the management of patients with multiple sclerosis. The Omnia-Prova Education Collaborative, Inc. designates this enduring material for a maximum of .25 credits AMA PRA Category 1 Credit(s)™. Physicians should claim only the credit commensurate with the extent of their participation in the activity. The American Medical Association has an agreement of mutual recognition of Continuing Medical Education (CME) credits with the European Union of Medical Specialists (UEMS), the accreditation body for European countries. Physicians interested in converting AMA PRA Category 1 CreditsTM to UEMS-European Accreditation Council for Continuing Medical Education CME credits (ECMECs) should contact the UEMS at mutualrecognition@uems.eu. TOPEC Global designs educational activities based on evidence-based medicine, needs and gaps analyses, learner feedback, and more. Its mission is to serve as an innovative and relevant resource for clinical content and educational interventions across a broad spectrum of specialties. The views and opinions expressed in this educational activity are those of the faculty and do not necessarily represent the views of TOPEC and TOPEC Global. This presentation is not intended to define an exclusive course of patient management; the participant should use his/her clinical judgment, knowledge, experience and diagnostic skills in applying or adopting for professional use any of the information provided herein. Any procedures, medications, or other courses of diagnosis or treatment discussed or suggested in this activity should not be used by clinicians without evaluation of their patients’ conditions and possible contraindications or dangers in use, review of any applicable manufacturer’s product information, and comparison with recommendations of other authorities. Links to other sites may be provided as additional sources of information. Once you elect to link to a site outside of TOPEC Global you are subject to the terms and conditions of use, including copyright and licensing restriction, of that site. Disclaimer: Some products discussed in this activity may not have received regulatory approval by the US FDA for the treatment of patients with Multiple Sclerosis. The FDA has stated that “good medical practice and the best interests of the patient require that physicians use legally available drugs, biologics and devices according to their best knowledge and judgement”.